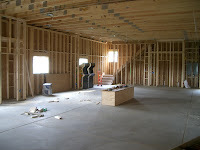 Just got word from the builder that his crew will be on vacation all this week. So I guess not much will be happening with the building until Monday. Well, absolutely nothing happened Thursday or Friday. *sigh* I'm not sure what the hold-up is. It's kind of frustrating, because people keep asking me when the gameroom will be done, and I don't know since days and days go by where nothing happens. Oh well. 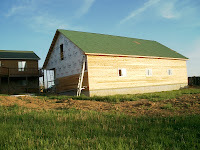 It gives us more time to save up for the remainder of the construction cost. In other news, I picked up a couple Centipede machines for a buddy that does paint restoration work for me, and had no room in the house to put them. So I stuck them in the garage for the time-being. I took a couple photos, so now you can kind of get some idea as to the scale and what it will look like with machines in the gameroom. Sorry I haven't updated in almost a week. Absolutely nothing was going on. So I was happy this morning to see the workmen back again. 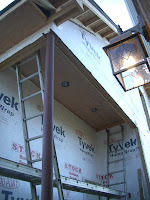 They began siding the garage bay doors, and got one of them almost done. It's just missing a curved piece at the top. I guess it's to give the 4" v-groove boards something to nail in to, but they added additional blocking on the inside wall behind the garage bay door they sided today. They had to make the closet for the HVAC unit bigger, which meant ripping out a good portion of what was there. Oops. Here's what it looks like now. For the record, I had asked for all this to be outside the building anyway, but it didn't happen that way. Oh well. They added the upstairs door today. They did a little bit of the siding on the front around the garage doors. Other than that, it's just been working out the money aspect of overything. The builder gave us the bill for some of the additional stuff we've been adding beyond the original estimate (things like the interior paint, etc). That came to $12,795. On top of that there's the stonework we are putting on the exterior - that comes to $8650, and the wood design I want for the garage bay doors comes to another $4900 additional. This is on top of the $12k we had to pay to have the septic field moved and the electrician's bill which we are having to cover due to all the additional work he is doing. I'm not doing a very good job keeping this project on budget. The blacklight carpeting for the downstairs hasn't been estimated or paid for yet. I'm guessing the estimate will come in at around $5k, which we don't have. So we're going to have to put off the carpeting for a month or two until we save up for it. As a consequence, the games won't be able to be moved in until then. Unlike the LA Film Festival screening, I probably won't be attending the NY showings. Not much happened today. 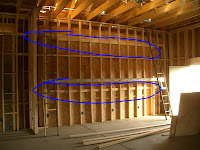 I did work over the weekend running phone wire through the building, and I added the rough-in boxes for the speaker wire connections. This is the window seat for the upstairs window. It will open up on top. They also extended the bulkheads on the front of the building (at my request) to match the size of the ones in the rear of the building. They were smaller due to how the front of the building was enclosed to seal off the garage bay doors. You can see how they added an extra piece to bring them out a little farther. And lastly they finished up the cedar wrap around the breezeway ceiling. The builder said they might be able to start drywalling in the next week or so! The LA Film Festival has just announced the films for this year's upcoming festival and Chasing Ghosts will be playing there! This is the film about the 80s arcade scene for which I provided some of my computer animation. I will be there. Make plans to attend if you can make it! Today they.......worked on the siding! Yay! They also added the ceiling to the outdoor breezeway. Yep, they are still working on the siding! And the electrical! The covers are on but here's the current state of the breakers and wiring. The recessed lighting for the outdoor breezeway cutout. They've been continuing to work on the siding and the electrical work (lots of wires!). Lots of stuff happened today! Here's the electric meter (just for the garage). Yikes. They sheeted over 2 of the 3 bay doors (probably leaving the last one open to let light in). It actually looks even BIGGER inside with the sheeting. The wires hanging down in these photos are where the 10 blacklight ceiling fixtures will go. This is the large upstairs window before and after, and a picture of the view from the window. The support pole for the cutout breezeway. The upstairs with the window in! They also added another layer of flooring down as it felt pretty flimsy with just the one layer of plywood. 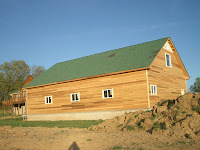 The progress on the siding. The door for the storage under the stairs. This was going to be a little hideout for the kids (they asked for it), so the door was supposed to just be a little crawlspace access. I need to let the builder know.